Links to come: video (below! verify for yourself), budgets, and salt shed/garage contract (this one piece of documentation may take awhile). Here is the Register Star article on the same hearing you can watch in video below. No mention in the paper of the fact that the same accountant/bookkeeper in Stockport and Stuyvesant and that Stuyvesant's numbers don't add up. This article is from the same hearing. Also, not really what I took away from the meeting. The website had the wrong boat on it. 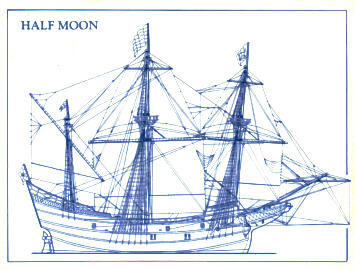 A number of residents objected that this is The Half Moon, Look at the boat on the website when it comes out and see if the one the town paid for looks historically accurate. This is in the public domain. Otherwise, it seems like a waste of money to hire a firm to make a website with no more functionality than this blog that I spend $15 a year on ($10 for the domain name and $5 to have google use the domain instead of .blogger.com). At the start of 2011 end of 2010, the town reserve fund was about $200,000. I found the preliminary 2012 budget passed in November 2011. UNEXPENDED BALANCE, last line of the 2012 budget page 7 says $100,000. In 2011 the town spent $100,000 of the reserve fund by November 2011, or so they reported. Supervisor Ron Knott said $180,000 as of January 1, 2012. Not true. Less than $100,000 as of the beginning of 2012. Ron is clearly wrong. Not $180,000. Can't be. Less than $100,000. Must be. See minute 5:00 in the video at the end of this post. At the time the budget listed $100,000, November 2011, the town only listed $40,000 in the budget for Whiteman, Osterman and Hanna but had already spent or received invoices for $100,000. I can post the 2012 budget and the invoices and I will, when I get the video of the hearing. The documents (video, budget, invoices) will confirm that 1) Knott said $180,000 when that cannot be true, 2) the budget listed $100,000 as of November 1, 2011; 3) that the town paid Whiteman, Osterman and Hanna in excess of $75,000 between the November 1, 2011 and February 1, 2012. The town wrote Whiteman, Osterman and Hanna a check for $75,000 after the November budget, meaning the reserve fund would have been $100,000 minus $75,000. Some of the $75,000 paid in late 2011 may over lap with the missing $60,000 from the budget but not all of it. The tax increase only added about $65,000 according to the budget we received tonight. I will scan and post that document too. Look at the current revenue lines in the current budget. The total amount billed by Whiteman and Better is more than $200,000 and it has never been fully listed in the budget. It mostly came out of the reserve fund. Only 150,000 is kind of listed at Lines A8010.1, A8010.4, A8020.4 this year but some money is missing, maybe $50,000 not reported. Next, the board announced they were planning to borrow $700,000 for the garage/salt shed project. However, the town only received one bid for this entire project and that bid was for $450,000. I will post those documents too when I get them. The town sold a truck for $40,000 and didn't list it. The money went into and out of the reserve fund. Further, the town accountant, Fitzgerald, penciled in $2750 for Tal Rappleyea in 2009. There is no other paper justifying the money moving into Tal's pocket other than Fitzgerald writing the number on a list of payments on a computer print out. You can't just write in a number by hand on a print out and say "That explains it." The same accountant/bookkeeper Fitzgerald did not notice $250,000 disappearing from Stockport. The truck covers the difference between the reported $150,000 lawyer expenses and the $200,000 actual expenses. The $700,000 bond covers the fact that they spent the whole reserve fund, all $200,000. They are borrowing to cover operating expenses.